February 1, 2, 3, 4 & 5, 1983. This play has the virtue of providing a number of interesting parts for young people and this was my main reason for staging this production. The Company wished to bring more of their young members into a major production and what better vehicle for such an enterprise than a play about a family with four teenage children. In fact five of our ‘Young Wick’ are appearing because Amanda Dawes plays Pearl Bond – the sort of young woman of whom mother would not have approved. The other talented newcomers are Andrea Smith, Louise Bray-Allen, Sarah Ockenden and Nicolas Thorne [who all appeared in Oliver] Good luck to them all. As for the ‘seniors’; I am delighted with them – their triumphs in earlier Wick plays are too numerous to mention. It is also notable that we have two parent daughter couples in this play and even curiouser, is that Amanda is playing the part her mother played as a teenager when Young Wick Players presented this play in 1956. The play is, I consider, a good, if sometimes obvious slice of Victorian cake. Colour is provided by references to the old Chain Pier, the Penny-farthing bicycle and so on. But it has warmth and a sense of family – even though the Victorian attitude displayed is somewhat alien to our present day anti-chauvinist trends. Where are the heavy fathers now? WICK Theatre Company blood several youngsters into their third production of the season at the Barn Theatre, Southwick, next week. Providing the injection of youth is the company’s junior equivalent, Young Wick, as the group present Pink String and Sealing Wax by Roland Pertwee – a murder story set in Brighton in the 1880s. Produced by George Porter, the play features a wealth of acting experience in Margaret Ockenden, Ralph Dawes, Neil Shephard and Peter Joyce. The youthful back-up comes from leading Young Wick members Sarah Ockenden, Nicholas Thorne and Amanda Dawes, with additional support from new-comers Andrea Smith and Louise Bray-Allen. People wanting to know ‘whodunit’ should visit the Barn between Tuesday and Saturday inclusive. Each performance starts at 7.45 p.m. THE WICK THEATRE COMPANY could hardly have chosen a more demanding play than Pink String and Sealing Wax for the ‘first team’ debut of their young protégés. The wordy Victorian melodrama by Roland Pertwee threw five youngsters from the Young Wick Group right into the limelight of the Barn Theatre, Southwick last week. Director George Porter’s aim of introducing the youngsters into a major production was achieved, but not without a few hiccups. It took some time for the young actors to warm to their parts and the prompt was kept busy in the first scene. But, with the help of the older, more experienced members of the cast, they coped well with the play and its rather too obvious murder plot. Briefly, Albert, the teenage son of chemist Edward Strachan, was set up as an accessory to the murder of Pearl Bond’s husband. With help of his three sisters and eventually his father, Albert proved his innocence and the unsavoury Pearl, we were told, jumped off the pier. Nicholas Thorne, as Albert appeared to lack confidence on stage, but was well cast in the part of the naive young man in the hands of his buxom lover, Pearl. His eldest sister and confident Emily, was sympathetically played by Sarah Ockenden. Sarah’s mother Margaret gave a memorable performance as Mrs. Strachan. Adding light relief to the play was Andrea Smith, as the youngest daughter, Eva. While her nervousness got the better of her at the beginning she warmed to the part delivering her lines with confidence and clarity. Two of the better performances of the evening came from Ralph Dawes, as the stern father, and his daughter Amanda, who looked and obviously enjoyed the part of Pearl Bond. Also appearing were Louise Bray-Allen as the third daughter, Jessie, and Neil Shephard and Peter Joyce as Dr. and Ernest O’Shea. 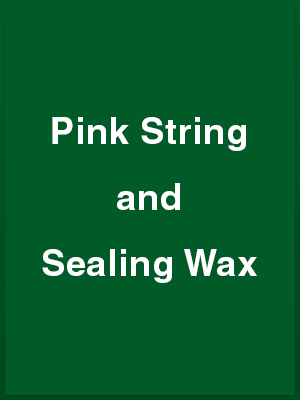 THERE are two parent and daughter combinations in the Wick Theatre Company presentation of Pink String and Sealing Wax. Ralph Dawes plays stern Victorian father Edward Strachan while his daughter Amanda is the loose-moralled Pearl Bond. And Margaret Ockenden is the woolly-headed Mrs. Strachan while her daughter Sarah plays one of her stage daughters, Emily. Amanda Dawes is playing the part that her mother, then Betty Carpenter, played as a teenager in 1956. Ralph Dawes gives an unerring performance as Edward Strachan, chemist and public analyst and Margaret Ockenden is delightfully vague and strives, albeit unsuccessfully, to be a buffer between the dominating father and the children. Andrea Smith is a very good little Eva, a girl with a mind of her own. In fact, all of the Strachan children – Nicholas Thorne as Albert not wanting to follow in the family business, Louise Bray-Allen as would-be actress Jessie and Sara Ockenden as Emily of the golden voice – have in common that they are completely convincing as a family united against their father’s conviction that what he says is right. Neil Shephard gives a pleasing study as Dr. O’Shea and Peter Joyce as son Ernest might well be an up and coming young barrister. Pearl Bond is the show part and young Amanda Dawes plays her splendidly, not losing sight of the pathos mixed with the brashness. George Porter directed with his experienced expertise. There are performances tonight and tomorrow at the Barn Theatre, Southwick, at 7.45 p.m.